Give The Cleaner Plate Club a Listen with this podcast from KCUR, our local NPR affiliate! It's been a crazy couple weeks back from vacation. Life is normally a blur, but it hit warp speed. I would guess the big news around this kitchen is that our book is now out and we're doing some of the PR work for it — along with the busy day job, of course. The link above was a new experience for me, I spent 45 minutes on live radio, taking calls from parents. They had some great tips, recipes and insights so give it a listen. Sorry about my voice. Congrats to _vtg_ as you were the only comment for the last book giveaway, you will get all three. Cool, huh? Leave me your snail mail address at farmerfare [at] gmail [dot] com. 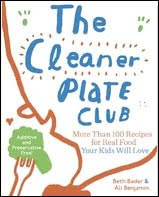 Which brings me to this month's book giveaway, a copy of my book, The Cleaner Plate Club! Since it would be kind of vain to review my own book here, I'm just going to post some of the nice comments from folks who have read it. You know the drill, leave me a comment below and you will be entered into a random drawing. "In our hectic, fast-paced, busy lives, parents often put healthy eating on the back burner. The Cleaner Plate Club is full of tips to help families go ‘from nuggets to nutritious.’ A must have for every family’s kitchen!"